If you’ve been reading my blog for any length of time you’ll know that one of my favorite decorating items is my branch that hangs on the wall in my living room. I got the inspiration from a magazine article, then saw an awesome “decorator branch” at a Mexican restaurant in Bisbee, AZ. I couldn’t wait to start my search! I was determined that I wouldn’t cut it off of a tree, but that I’d find it somewhere naturally. It took almost 9 months, but finally I found the perfect Manzanita branch laying on the ground on a hike in Sedona, AZ. You can see the full story here. So, ever since then I have thoroughly enjoyed finding new and fun ways to decorate this piece. Sometimes its seasonal, like this closeup of one of my winter branches. Or you may have seen in a recent post where I hung these vintage reproduction postcards there in the summer. This is what it looks like for the Fall season. Novel idea, huh? To hang leaves on a branch. If you live in a part of the country that actually has an ample supply of fall leaves you can just bring them in from the outside. For those of us who live in the desert, we have to buy silk leaves to hang up. 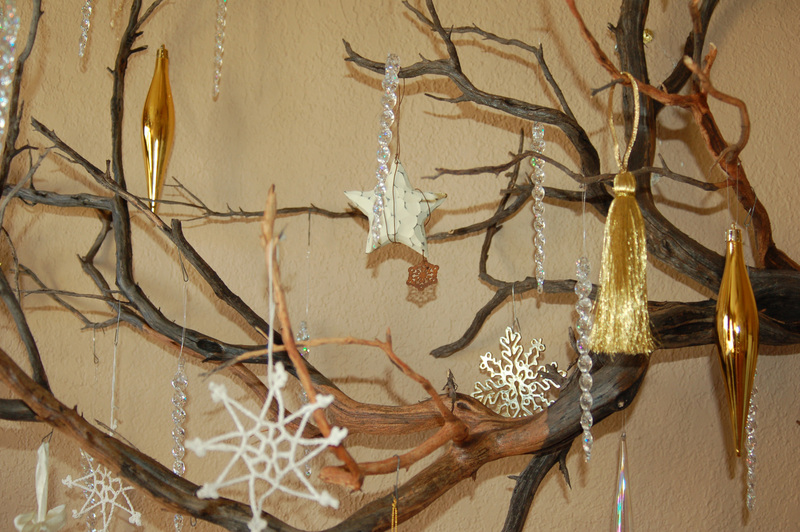 Just one of the many dozens of ideas for things to do when decorating a simple branch on your wall. I usually don’t have much trouble in the Fall and Winter, but what would be your ideas for decorating it in the Spring and Summer? You’ll love the things they come up with there too! I’ve been meaning to put some branches in a vase or crock; I may just have to get moving on that! How about butterflies in the Spring? You could use a butterfly paper punch or die cut and create pretty butterflies from scrapbook paper…..
Butterflies are a great idea! I also have a pattern for a bird made of fabric which I was thinking might be cute. Love your branch! I had to laugh since I just had The Welding Man bring such a branch inside yesterday for my livingroom wall. I already have branches in vases and hung with Halloween decor balls, but I wanted something more seasonal with colorful leaves now, silver and white snow flakes for later. For Spring? Tissue flowers, butterflies, small Easter eggs…perhaps decoupaged with book paper or music? Mini paper cupcakes for the kid’s birthdays? Already I’m liking this branch idea more and more. Great ideas Ann! I do hang lovely glass and ceramic Easter eggs at Easter. I like the tissue paper flower idea too! I need to get my Manzanita branch up!! 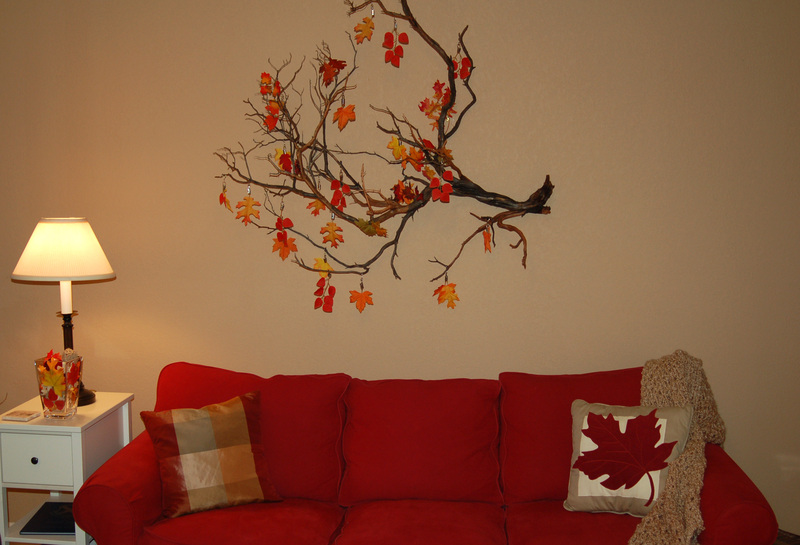 So inspired by your creativity in decorating your branch throughout the seasonal changes. I can’t wait to see what you do with your branch too. P.S. I like your branch MUCH better than your inspiration branch. God picked out a good one for you! Thanks Judi! One of the things I like most about using a branch is that it’s free and many of the decorations that go on it can be re-purposed from other areas of the house!